As the Mueller Probe throws up no evidence of Russian collusion, the 4D chess board has acquired a new piece. Impenetrable, dynamic, Queen-slaying, King-killing…The Donald. In chess, the traditional view of the king is that he is a fat, slow, lazy vulnerability, whose lack of field-experience can often cost a player the match. More symbolically, he represents the permanently outdated state, which suffers perennially from a lack of vigour and malleability, and must constantly be saved by either its knights (army), bishops (religion) or pawns (general populace). While Trump’s waistline may fit with this analogy, it’s the only thing that does. In fact, if there’s anything the last four years of the President’s multiple, concurrent 4D chess battles have taught us, it’s that the old black and white board needs to be christened with a new piece: The Donald. The year was 2016 and the odds were stacked heavily in Hillary Clinton’s favour. Her masterful manipulation of pawns like CNN and the leftist news cartel meant the cackling queen was well protected by her minions. However, Clinton didn’t know that Trump was playing a different game altogether. 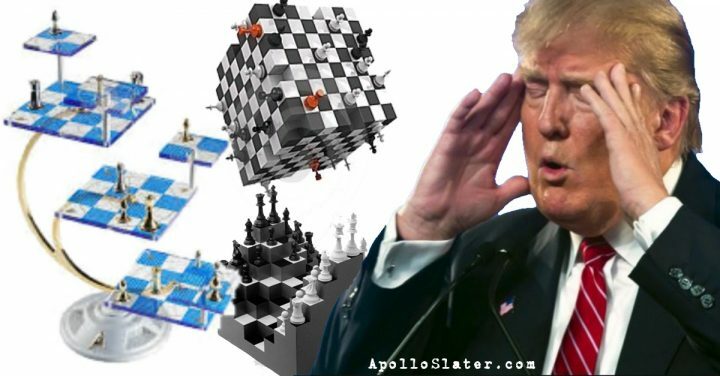 While Hillary Clinton was playing the same 3D chess taught to her by famed grandmaster Saul Alinsky, The Donald flipped reality on its head and entered into… The Trump Dimension. In the Trump Dimension, The Donald can go wherever and do whatever he pleases. In this case, he didn’t even have to move, as the desperate Clinton continued to degrade her working class voters, and present an unlikeable image to the American public. The queen by this point had been relegated to the sidelines, and could often be seen wandering aimlessly through the local shrubbery in a Xanax-induced haze (blatant speculation on the part of the author). But the remaining pieces on the board still sought to carry out the aims of their former leader, and thus unfolded the deep state saga. We had a political pawn in the form of former FBI Director, James Comey, who flopped like a wet fish when he tried and failed to pin President Trump to alleged wrongdoings. The ‘scandals’ kept on coming, from the revelation that Trump slept with a woman, to the allegations that he lied about the number of burgers present at a White House dinner. A four-year investigation by CNN into Trump-Russia collusion has thus far thrown up ZERO clues, and more recently, the Mueller probe entered the headlines once more as the country awaited the details of the Special Counsel’s report. According to Fox News, the summary of the Mueller report released Sunday reveals no evidence of Trump-Russia collusion whatsoever. The only people surprised by this must be the ones who didn’t see CNN staff repeatedly admit that Russia was a big ‘nothing burger’. One hopes this draws a line under CNN’s constant Russia-bating, but I hesitate to hope for this much. In the meantime, if I may stretch the chess analogy once more, the next move in on the 4D chess board could involve the rook. The rook stands at the edge of the board, patrolling the borders, acting as… a wall. If The Donald can play his rook well, and the wall does indeed go up, then we should heretofore rewrite the rules of chess for time eternal. The king is dead, the queen is crooked – long live The Donald.